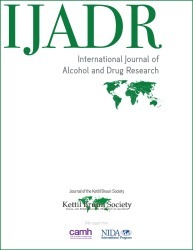 The International Journal of Alcohol and Drug Research (IJADR) is published on behalf of the Kettil Bruun Society for Epidemiological Research on Alcohol (KBS). The journal publishes peer-reviewed research that furthers understanding of substance use and substance-related problems from an international perspective. IJADR is a member of the International Society of Addiction Journal Editors (ISAJE). The editors of the International Journal of Alcohol and Drug Research (IJADR) are pleased to announce the release of the second issue of our 7th volume. This issue contains five research papers focused on a wide range of substance use topics such as family member’s satisfaction with alcohol and other drug treatment, risk factors for fractures in pre-menopausal drinkers who are alcohol-dependent, and the risk reduction potential of heat-not-burn tobacco products. The issue also includes a methodological description of the multinational GENAHTO (Gender and Alcohol’s Harms to Others) project. These papers represent research collaborations occurring in Brazil, New Zealand, Canada, Russia, England, and Germany, to name a few. Thank you for your interest in IJADR and please consider submitting manuscripts for publication consideration. Vol 7, No 1 (2018) published. The editors of the International Journal of Alcohol and Drug Research (IJADR) are pleased to announce the release of the first issue of our 7th volume. This issue contains both qualitative and quantitative investigations of alcohol and other psychoactive substances from nearly every continent. Vol 6, No 1 (2017) published. The editors of the International Journal of Alcohol and Drug Research (IJADR) are pleased to announce the release of the first issue of our 6th volume. This issue contains both qualitative and quantitative investigations of alcohol and other psychoactive substances from nearly every continent. Vol 5, No 3 (2016) published. The International Journal of Alcohol and Drug Research is pleased to announce that Vol 5, No 3 (2016) is now published. Vol 5, No 2 (2016) published. The International Journal of Alcohol and Drug Research is pleased to announce that Vol 5, No 2 (2016) is now published. Vol 5, No 1 (2016) published. The International Journal of Alcohol and Drug Research is pleased to announce that Vol 5, No 1 (2016) is now published. Vol 4, No 2 (2015) published. The International Journal of Alcohol and Drug Research is pleased to announce that Vol 4, No 2 (2015) is now published. As of September 1st, 2015, The International Journal of Drug and Alcohol Research implemented a new policy of charging $750 US per manuscript of up to 3,000 words (excluding references, tables, and figures). There will be an additional cost of $150 per 500 words over the word limit. These fees are necessary in order to keep the journal operational for the long-term and to provide open access. Fees will be waived upon request. If you wish to have publishing processing fees waived, please contact the editor in advance of submission providing justification. The International Journal of Alcohol and Drug Research is pleased to announce that Vol 3, No 4 (2014) is now published. The International Journal of Alcohol and Drug Research is pleased to announce that Vol 3, No 3 (2014) is now published. This is a "Special Issue" on "International Perspectives on Alcohol Control Policies in Low and Middle Income Countries".